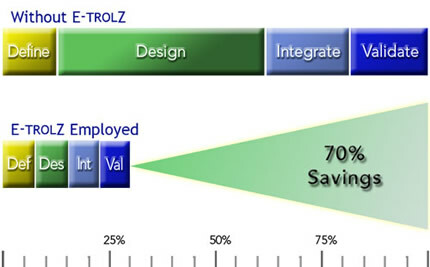 By delivering 5 degrees of integration, your product development time enjoys a huge savings. By integrating the hardware, I/O, drivers, RTOS, and API into a measurement and control subsystem, you are ready to begin application programming and testing right out of the box. Our approach cuts your electronics design time by 75% and cuts your hardware and driver integration by 75%. In addition, our approach eliminates your hardware / software / integration risk - the most difficult and variable part of your product development. With a proven platform, your device validation is also quicker. Using our product easily gets your product to market 70% faster. © Copyright 2005-2013 E-trolZ, Inc. All Rights Reserved.